Horse Care – Where Do I Begin? I recently learned that I was the new owner of a couple of horses. One a pony and the other a brown and white horse. The pony has been broke before. The big horse has not. We have land for them to roam and water and plenty of food for them. But I have never owned a horse and would like to most definitely learn. I just don’t know how to approach this situation. How should I begin this process? Well, you have a most exciting adventure ahead of you. First of all, although you can learn a lot from the internet, books and DVDs, the best possible advice I can give to you is for you to find an experienced, trusted horse owner or trainer/instructor in your area who can help you get started. For example, you will need to find a farrier and a veterinarian and an experienced horse owner/trainer/instructor in your locale so you have people to contact. An experienced horse owner will be able to take a look at your fences and pastures and give you an opinion as to if their suitability for horses and if your pastures provide enough of the right type of feed. Even if you have wonderful pastures and water, you will need to provide the horses with salt and mineral blocks. Horses should have access to salt at all times. As far as taking care of the horses on your land and managing your fences and buildings, I’ve written a book specifically for that. It is called Horsekeeping on a Small Acreage and discusses all you need to know as far as the care of the horse on your property. When it comes to specific health care skills such as feeding, deworming, vaccinations, hoof care and so on, you can ask your farrier and veterinarian to help you somewhat and you can also refer to Horse Health Care and Horse Hoof Care. Now when it comes to handling the horses, ask your experienced new friend to help you assess what the pony and the horse know and what they need to learn. Then you can make a plan as to how to proceed from day to day. It is probably best for the horses and your safety for you to have help with both the pony and the horse until you have developed the confidence to handle them on your own. I have posted much information on my website about ground training, manners and so on which will be very helpful to you. And I’ve written many books on all levels of training. 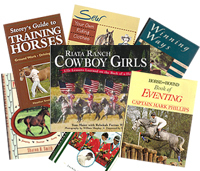 You can look through a complete list of books by topics in the Book Barn. Once you get started, you will have a hundred more specific questions, so feel free to write again. I have a Quarter Horse gelding that is really good about just about everything. My problem is that he seems to always spit out the wormer, usually with a big wad of hay or grass. He takes the wormer good enough but then spits it out. I hate to waste the dang stuff ’cause it’s so expensive. Is there any way to make sure he gets the wormer down? First of all, the correct name for the paste that you are trying to give your horse is dewormer, not wormer. A dewormer gets rid of worms; a wormer would give your horse worms ! It’s great that your have mastered the skill of giving your horse the dewormer and that he accepts deworming without a fuss. To be sure that the dewormer gets to the worms and does its job, you’ll need to make sure your horse’s mouth is clean before administering the paste. To see how to do this, watch this video clips “Wads ‘n Worms” from our DVD, 101 Horsekeeping Tips. Horse Health Care – Deworming Recommendation? your more typical deworming schedule. What would you suggest? Mexico. And it is not only the elevation and weather, but your layout and management practices and the number of horses on your horse property and those properties nearby that will factor into what deworming product to use when.